Mother’s engagement photos for the newspapers. I htink the one at far left was the one that was used. Foreword: I write this on Sunday morning (Day Four), drinking my second cup of chicory coffee on the front porch wearing the white terrycloth bathrobe I always wear here and lstening to the sounds of birdcall and distant traffic. 1) We were the Early Bird Special Kids, leaving promptly at 5 PM with a 20% off coupon for ye Y’Chyrley’s (which is not far from the house, the principal criterion). A rich, and therefore Very Bad But Tasty Dinner: spinach artichoke dip, chicken and pasta with whiskey cream sauce, and French silk pie. Is there anything better than French silk pie? 2) Having both had naps, we set to work almost as soon as we got back home. First assignment: packing up my things for the mover to review on Monday. I confess I always have anxiety about this - can anything ever be packed safely enough? - and like Hepzibah Pyncheon and her teacups in The House of the Seven Gables, we submerged things in bubble wrap that, should they break, would break my heart, too. That Mexican tin shrine, for instance. 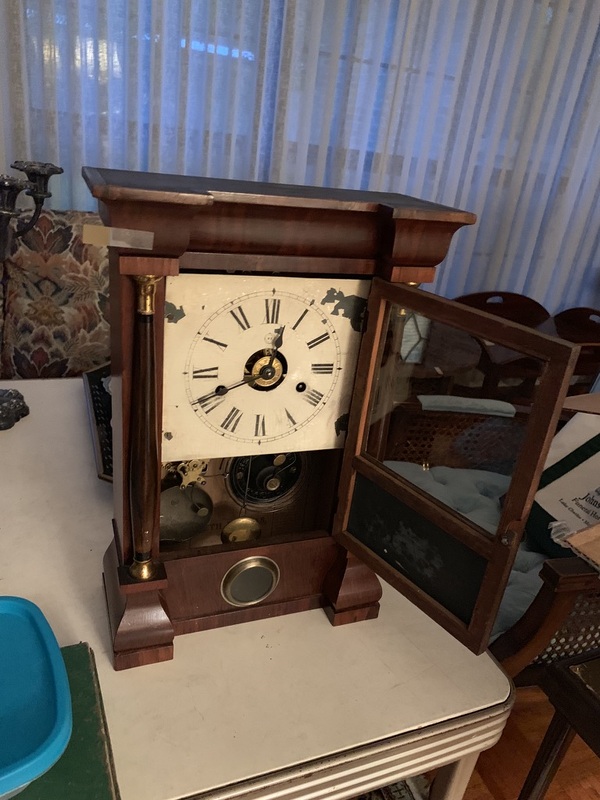 2a) And the Thorson Clock, which my great-grandfather Otto purchased (if I recall aright) not too long after he arrived in America. Gramma gave this to our family in the late 1970s, and I remember how exciting it was to have a clock that actually chimed on the hour! It no longer works, alas . . . Laura directed me to fill the inside gently with bubble wrap to stabilize the pendulum. 3) I must say, I am full of admiration for my sister’s ability to deal with packing stuff. Dayum, she’s a pro! 4) All this took less time than we thought - not even a complete screening of The Wizard of Oz, in fact - and then it was on to the next, bigger assignment: going through all the papers and other items that we heaped on Daddy’s bed back in February. This took us until midnight (though we each took time out at different points for a bath). About two thirds was from Gramma and Uncle Bill’s house, and the remaining third was Mother’s. Laura took apart photo albums to retain the photos of people we knew. “Who’s this?” she would ask, and more often than not my answer would be “I don’t know, Laura.” (These were mostly Minnesota relatives and friends of Uncle Bill, I suspect.) I ended up finding lots of correspondence, again, mostly from Minnesota relatives, including Mother’s cousin Laddy John, for whom she always expressed affection, and Laddy’s mother (or was it sister?) Jeannette, who was an especial friend of Gramma’s when they were young. In fact I found Jeannette’s condolence letter to Mother after Gramma died, which was so very sweet, and told stories about their growing up in Saint Paul. There was also quite a bit of college stuff to and from Mother. 4a) Things thrown away: Mother’s college French homework and other homework, and boatloads of Christmas cards from the 1970s and 1980s. Also a speech Mother gave to ye Cympfyre Gyrls about the importance of knowing about banking. We also threw away this issue of the paper with the full spread announcing the opening of the Opelousas store. That’s Uncle Hutch at bottom left, and Grampa two spots up. 5) To be honest, this was weary work punctuated with moments of insight and nostalgia. And when I came to the next box of manila folders browning to mahogany I said “Oh Laura, I just want to throw the whole thing away.” And then the very first folder I opened proved me wrong! Among other things it contained brief stories from our childhoods that Mother had written and dated, thank goodness. Seven-year-old me cleaning up some spilled cocoa powder by blowing it all away, for instance. Dialogue in the supermarket (in 1971) about what 1990 would be like after an episode of Captain Kangaroo in which they’d pretended it was 1990 to fool Bunny. Needless to say, I didn’t remember these incidents . . . and I was ready to toss out the entire box! You see, people?! It really is necessary to check everything! Laura’s rainbow hand. We tossed it. 6) It turned out to be Judy Garland Night at Bayouwood Court, as just after The Wizard of Oz, and me being too tired to think about a movie to have in the background, Laura chose the 1954 A Star Is Born for our A/V wallpaper. 7) Mother had retained all kinds of grade school paperwork, and all the horrifying decorating magazines of the early 1970s from when they added the den to our house on Orchid Street. Toss! There was also a pamphlet called something like What’s New With Marijuana? which certainly surprised me, ‘cause my parents were not that way. Keep! 7a) And again, why on earth did Mother cart all this from Orchid Street to that rental house to Bayouwood Court? Just didn’t think about it? Force of habit? 8) About this time I retreated to the bath, where I read the news on my phone, while Laura kept at it. When I emerged, she gave me another flat box, and retreated to the bath herself. I brought it to the kitchen table, and discovered it was full of genealogy info from Mother’s side of the family (particularly correspondence from a distant cousin she discovered in the 1990s but never met), sheaves of vacation information from Minnesota (toss! ), one dead, flaking cockroach (faugh! ), and . . . lots of loose photographs from when Gramma was a girl. Treasures! 9) At midnight we’d both had enough. And I tell you, I slept without waking for over five hours - and I needed it! My sweet Gramma as a little girl.